Texas history has seen a long list of thought leaders, artists, philanthropists, teachers, and so many more beyond the headlines – all of whom portray the creativity that has propelled our great state forward. As an annual celebration of all things Texan, the State Fair of Texas serves as a showcase for this creative progression over the years and applies it to how we approach our own nonprofit mission of promoting agriculture, education, and community involvement. Known for celebrating the creativity of Texas each year, the Fair’s Creative Arts department has been an integral piece of the State Fair of Texas since the very beginning. Offering more than 1,100 different contests, Creative Arts provides people of all ages an outlet to show off their skills and Texan pride. As a nod to the patchwork design traditionally found on quilts and craft projects, this year’s theme art recreates Big Tex’s iconic outfit into a Creative Arts masterpiece that could be found at the Fair. Join in on “Celebrating Texas Creativity” by trying your hand at participating in Creative Arts at the Fair. You can see all of the ribbon-winners displayed inside the Creative Arts building during this year’s 24-day run. For more information on 2019 Creative Arts contests and how to enter, visit BigTex.com/CreativeArts. Mark your calendars for the 2019 State Fair of Texas. 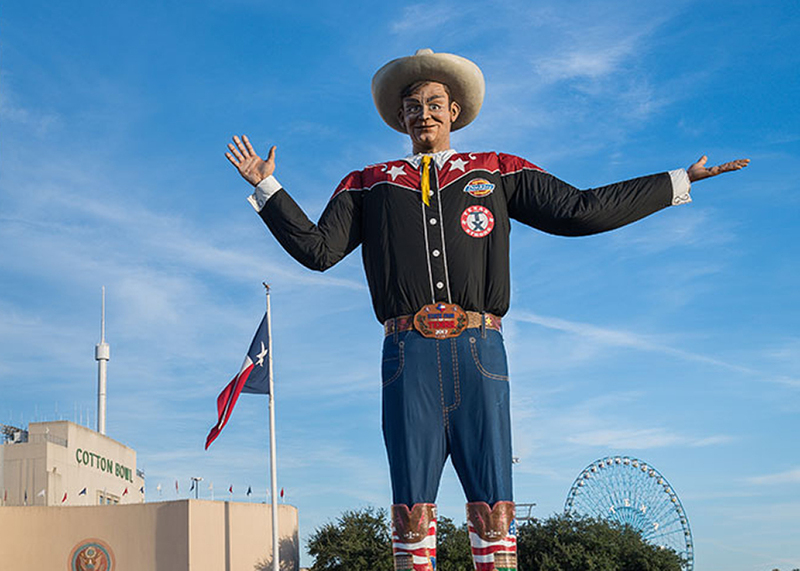 Say “howdy” to Big Tex and join the annual celebration of all things Texan, opening September 27 through October 20 at historic Fair Park in Dallas. Since its inception in 1886, the State Fair of Texas has celebrated all things Texan by promoting agriculture, education, and community involvement through quality entertainment in a family-friendly environment. The State Fair of Texas is a 501(c)(3) nonprofit organization with proceeds helping to preserve and improve our home, Fair Park; underwrite museums, community initiatives, and scholarship programs to support students throughout the Lone Star State pursuing higher education; and help improve State Fair operations. The 2019 exposition runs September 27 through October 20 in Fair Park. Visit BigTex.com for more information.